Hundreds of people have been arrested in a crackdown in Russia after thousands gathered for massive anti-corruption protests Sunday in the nation's capital, and other demonstrations were held in dozens of cities across the country. Between 7,000 and 30,000 people demonstrated in Moscow, and up to 10,000 in Saint Petersburg in Russia's largest anti-government gatherings since at least 2012. Huge crowds in Moscow's Pushkin Square protested Saturday against the Russian government, according to The Associated Press, which described the demonstration as among the biggest shows of public opposition to the Kremlin in years. About 500 people were arrested in Moscow, according to Interfax, a privately-held, independent Russian news agency. Russian human rights group OVD-info reported that more than 700 people were detained in Moscow, 34 in St. Petersburg, and between 80 and 100 in other cities. Independent radio station Ekho Moskvy estimated that unsanctioned rallies in 82 cities and towns assembled 60,000 opposition supporters, in what may be the biggest anti-Kremlin protest since 2008. 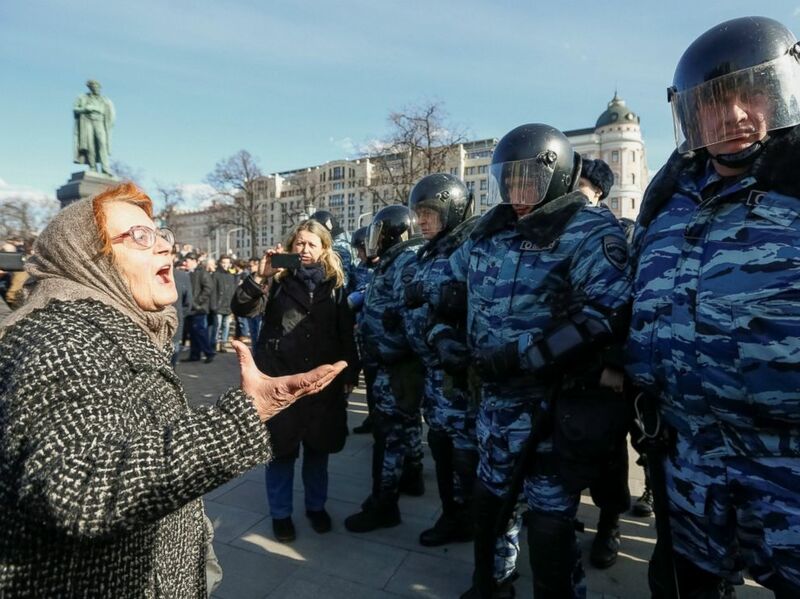 A woman argues with law enforcement officers as they block a rally in Moscow, Russia, March 26, 2017. On Monday, main opposition leader Alexei Navalny, who called the protests and was one of those arrested, appeared in court in Moscow. He tweeted from the building: "Hello everyone from Tversky Court. The time will come when we will have them on trial (but honestly)." Navalny faces a fine or 15 days of detention for organizing a mass rally and violating public order. Alec Luhn, a reporter for The Guardian, a British-based media outlet, wrote on Twitter that despite his showing press credentials to police, he was arrested while covering a rally and charged with "administrative violation for participating in unsanctioned rally." He later tweeted that he'd been released after more than five hours. Navalny was arrested while walking from a nearby subway station to the demonstration, the AP said. 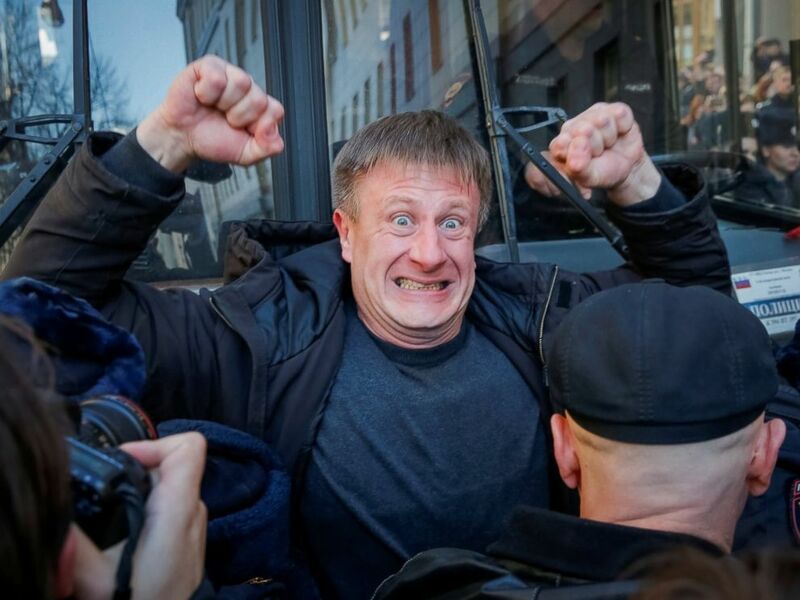 Navalny's spokesperson, Kira Yarmysh, told Interfax the opposition leader had been placed under arrest until Monday, when a hearing is to be held. The deputy director of Navalny's organization, the Fund for Combatting Corruption (FBK), which had called for the protests, said the organization's offices had also been raided by police. 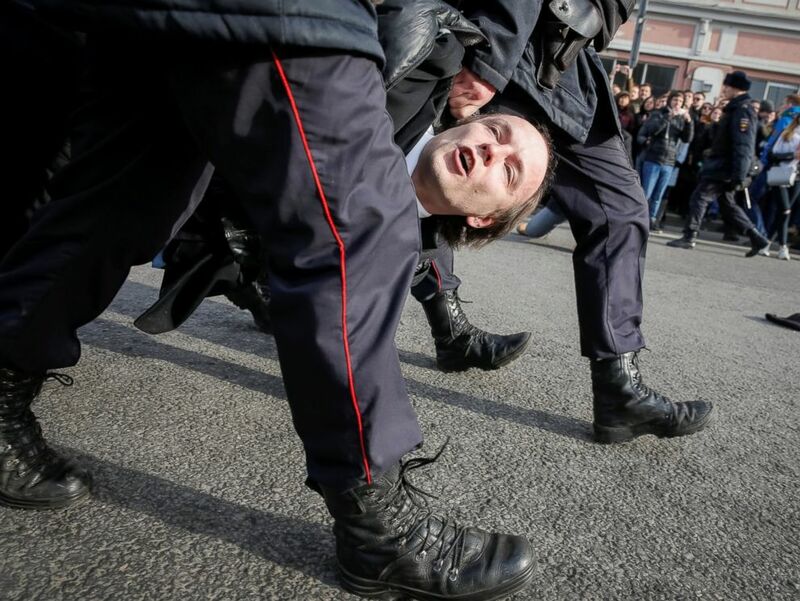 Law enforcement officers detain an opposition supporter during a rally in Moscow, Russia, March 26, 2017. The FBK conducts investigations into senior Russian officials and releases its findings in slick, irreverent videos. The protest today was organized to demand that Russian authorities look into the fund's latest investigation, released this month, which alleged that Russian prime minister and ex-president Dmitry Medvdev had amassed a massive property empire using a corrupt scheme based on a network of charities. The investigation alleged Medvedev had built himself vast mansions, bought vineyards and yachts worth as much as a $1 billion. The video laying out the investigation has been watched by at least 9 million people. Authorities have ignored the claims and refused to investigate. The allegations around Medvedev appear to have struck a chord in Russia, as pressure on freedom of expression has reached a peak at the same time people's living standards have fallen. An opposition supporter blocks a police van transporting detained anti-corruption campaigner and opposition figure Alexei Navalny during a rally in Moscow, Russia, March 26, 2017. The State Department criticized the arrests, and called on Russia to immediately release all the demonstrators who had been detained. "The United States strongly condemns the detention of hundreds of peaceful protesters throughout Russia on Sunday," acting spokesman Mark Toner said. "Detaining peaceful protesters, human rights observers, and journalists is an affront to core democratic values. We were troubled to hear of the arrest of opposition figure Alexei Navalny upon arrival at the demonstration, as well as the police raids on the anti-corruption organization he heads." The European Union has called on Russia to “release without delay” what it called peaceful protesters. The demonstrations in Russia followed protests in neighboring Belarus on Saturday against that country's president, Alexander Lukashenko, who has ruled the small, landlocked country since 1994. The Belarus demonstrations resulted in roughly 400 arrests, a human rights group told the AP. ABC News' Ben Gittleson, Patrick Reevell, Mike Trew, Anastasia Butler, Dean Schabner, and The Associated Press contributed to this report.